It's easy to find good accommodation if price is not so much of a concern to you (just go to Agoda or any of the hotel booking web and they will recommend one to you). But when money comes into play, it's hard to find a balance between cost and quality. There is this one hotel that I have recommended to so many of my friends. It's called Toyoko Inn (more chains in Japan) and it really offers convenience at an affordable rate (always less than S$100 per night for two). I will always book this hotel if I am in Japan for a holiday. 1. The hotel is always located within walking distance to the subway station. 2. It offers complimentary breakfast, bottled water and wifi. 3. It has got it's own membership programme (can be applied on the spot) that allows you to redeem one free night (single room, top up if you are getting double) after every 10 nights booked (points can be accumulated at any branch). Furthermore, membership comes with perks like 5% discount on weekday + Saturday and 20% discount on Sunday and public holidays. 4. Free cancellation policy (cancellation can be done online) up till 4pm on the day of check-in. 5. Book now (online with instant confirmation) and pay only when you check-in at the hotel. 6. You can get map of the surrounding area from the lobby. What is not so good about this hotel is that like most Japanese hotels (applies to the ones in Seoul and Busan), the room is quite small and you hardly have any walking space after you open up your luggage on the floor. If you are looking for a convenient location to stay for your next trip to Seoul, I recommend checking the Dongdaemun branch out. It's located within walking distance to Migilore and the whole lot of midnight shopping malls in Dongdaemun (meaning you can shop to late night without having to worry about transport). There is an airport shuttle that will bring you right to the doorstep of the hotel (usually we only get this for the premium hotels). Getting back to the airport is simple too, just board at where you alight (it's the first and the last stop so no worries about missing the stop or not being able to get up the bus). Afterall, we are looking for simplicity when we are travelling abroad right? 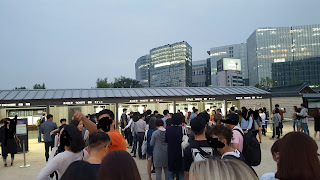 If you exit the hotel and turn to your right, it will bring you to exit 4 of Dongdaemun History & Culture Park where you can ride line 4 (Myeongdong) and 5 (GwangHwaMun, Yeouido). If you turn left, you will find exit 3 where you can ride line 2 (Ewha, Hongik, Jamsil). There are computer stations located at the lobby and you can also print for free. The lobby provides information on the shuttle timing (to the airport) and you can wait at the lobby for the airport shuttle to come. By the way, the service and offering of each branch is quite standard no matter where you are in. You can find Toyoko inn chains (sometimes not one but two at the same station) all around Japan. If I travel to Tokyo, I will stay in Ikebukuro Kita-Guchi No. 2. The reason is because Ikebukuro is a major station where NEX (Narita express) stops thus I can avoid the hassle of lugging my luggage and changing to another subway line (it will be a challenge locating subway lines if it's your first visit). However, Ikebukuro can get quite complicated at night (lots of alley and is known as one of the more complicated areas). Thus, on my recent trip, I stayed in the Shinagawa-eki Takanawa-guchi (eki means Station). NEX will stop at Shinagawa too. In addition, it's easier to get to Tokyo Disneyland/Disneysea (50 minutes away) from this stop. If you are travelling to Osaka, you can try out the Namba branch. It is located within walking distance to Dotonbori (where the Glico Man is standing) and Shinsaibashi (lots of shopping street in this area). Most importantly, there is direct subway line linking Namba Station to the airport. Getting to Kyoto from Namba Station (approximately 1 hour with 1 transfer) is easy as well. If you are travelling to Kyoto, you can try out Shijio Karasuma branch (within walking distance to many of the shopping arcade including Teramachi Dori). You can even talk a walk down to Gion to catch Geisha/Maiko (if you are lucky). We even walked all the way from Kiyomizu-dera, via Yasaka Shrine, back to the hotel (if you have the stamina and the weather is nice). There are two branches in Busan, one near Busan station and one near Haeundae beach. I have stayed in both and I think the one near Busan Station is more convenient if you are into shopping and visiting the attractions (nearer to subway). However, if you are a beach person then you should stay in Haeundae.